Civilization as we know it did not end on January 1, 2000. Planes did not fall out of the sky. People did not get stuck in elevators. The entire electrical grid did not go down. The Y2K disaster was non-existent, but the fear was real. How will we remember Y2K hysteria thirty years from now? If our children or grandchildren ask us, “Were people really scared about what would happen on January 1, 2000?”, what will we say? Will we say, “Only a few lunatics were afraid.”? Were the people who made us test all our government computers and put green, yellow, and red sticky dots on them lunatics? Were the managers who required us to produce three 2-inch ring binders of Y2K analysis reports last year lunatics? Were the people who canceled Seattle’s New Year’s Eve party mentally deranged? Were all those airline flights canceled because a large portion of travelers were crazy? The fear was real, but because the expected consequences did not materialize, we will probably forget the fear. Only those people who had beans and powdered milk for dinner again tonight (for the 110th straight night) will remember that people really did stockpile food. The rest of us will only remember that Y2K wasn’t any big deal. In 1969, the fear was real. The under-30 crowd may not believe it, but evolutionists were very afraid of the dust on the moon. They believed the moon had been accumulating dust for billions of years, and was covered by tens of feet of dust. They were afraid the astronauts would be buried in the dust raised by the rocket motor as the lunar craft landed. Whenever creationists site the small amount of dust on the moon as evidence of a moon that is much younger than expected, evolutionists say that they never expected to find more than a fraction of an inch of dust on the moon. Isn’t it funny how results affect memories? But I lived through the experience and remember the fear. Not only that, evolutionists were so certain that there would be harmful forms of life on the moon that the returning astronauts were quarantined to keep them from infecting the entire planet. Evolutionists believe that anywhere the conditions for life exist, life will evolve. They believed the conditions for life existed on the moon, and expected to find it there. If you ask them now, they will probably say that they didn’t really expect to find any life. If that is true, why were the astronauts quarantined? This month we received a “survey” (actually, a gimmick to solicit contributions) from The Planetary Society. The second question shows they still have this fear. 2. Planetary protection (for both Earth and Mars) has emerged as a potentially controversial issue in planning for an international Mars Sample Return mission. Do you think the Society should continue to press for a Sample Return mission? � Yes, because contamination is always a risk in planetary exploration. � Yes, but only if we take the time and spend the money to identify and implement every precaution possible. � No, a Sample Return mission carries far too much risk of contamination. � Yes, it could provide us valuable new information about minerals and geologic processes; and the risk of contamination is negligible because the existence of life there is unlikely. Their main reason for going to Mars is to find life, to attempt to find life and validate their belief that life naturally evolves everywhere it possibly can. Do you remember the ‘Martian meteorite?” Look back at the news reports from the fall of 1969. They were sure they had discovered life. 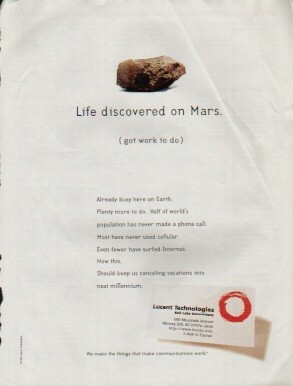 You might remember seeing these full-page ads from Lucent Technology and Time. 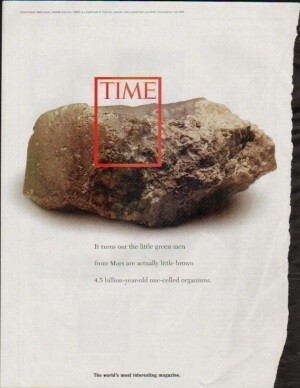 It turns out the little green men from Mars are actually little brown 4.5 billion-year-old one-celled organisms. Now that it has been proved that there is no evidence of life on that rock, evolutionists are reluctant to admit they believed there was any. It has just been a few months since Y2K came without incident, and already we are starting to forget what the fuss was all about. But, there really was a big fuss. So, when people start to tell you that nobody was really scared about Y2K, we hope you will remember that they really were. And when evolutionists tell you that scientists weren’t concerned about the dust on the moon, weren’t afraid of space germs, didn’t really believe there was evidence of life on the “Martian meteorite”, and never believed the single-species hypothesis, just remember how quickly people forget things they don’t want to remember.